Over half of people aged over 65 have some cataract development and most cases can be treated successfully with surgery. 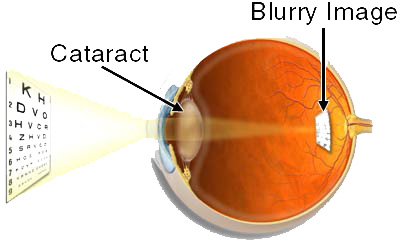 A cataract is not a skin that grows over the eye but a clouding of part of the eye called the lens. Vision becomes blurred or dim because light cannot pass through the clouded lens to the back of the eye. Younger people can also develop cataracts if they have an injury to the eye. Some medical conditions including diabetes or taking some sorts of medication may also cause cataracts. Will cataract affect my vision? You may notice that your vision is less clear and distinct. Car headlights and streetlights can become dazzling. You may experience difficulties moving from shade to sunlit areas. Colours may look different too and become faded. 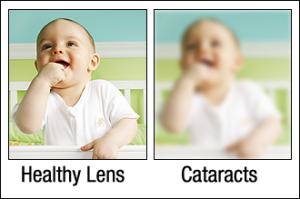 Early cataracts often make you more short-sighted, which in the early stages can be compensated for by altering the prescription of your spectacles. Tinted lenses or shielding your eyes from the sun may also help. However, the benefit is usually only short-lived as the cataract continues to progress and the symptoms increase. At this stage the most effective treatment for cataracts is a simple operation to remove the cloudy lens. Your optometrist will advise you when you need to be referred to your GP or hospital. Cataract surgery is one of the most common surgical procedures and in most cases can be carried out under local anaesthetic on a day-case basis, without an overnight stay in hospital. Diets or drugs have not been shown to slow or stop the development of cataracts. You will have an initial appointment where the ophthalmologist will assess your eyes. The ophthalmologist may also be able to correct your short- or long-sightedness so that you do not need to wear your glasses as much after the operation as you did before. Most cataract operations are done using a local anaesthetic, it takes around 20 minutes. Your eye will be covered to protect it from knocks for a few days after the operation. You will be allowed to go home the same day but must not drive. When the cloudy lens has been surgically removed it is replaced by a plastic lens implanted in the eye so that it can focus properly. This plastic lens is rolled up so that it can be inserted into the eye and placed in the lens capsule, where it springs into position. Usually, the new clear window greatly improves the quality of vision. Once you have had the cataract removed, it will not grow back. Once the eye has healed a change of spectacles is usually required. Occasionally your doctor will decide the eye is not suitable for a lens implant. In these cases, contact lenses or special spectacle lenses will be prescribed instead. Your eyesight will settle down in a few weeks. You will probably find that your glasses will need changing after the operation, so you will need to see your optometrist again for an eye examination about six weeks after the surgery.